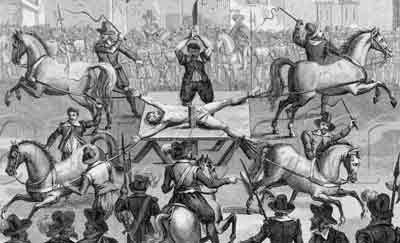 For nearly 600 years under English law, one could be ‘drawn and quartered’ for the crime of treason. Yet our present day crime is the Quarterly Report, upon which investors depend for their particular pound of flesh ‘drawn’ from the mismanagement of Corporations. Yet the simile is perhaps not too far removed from the fate of American Business. Present-day investors are the owners of business . . . its absolute owners. Thus what they demand is profit, something to put in their pockets and those demands come due every financial quarter. The punishment for missing such owner expectations is a drop in stock price, essentially devaluing the companies they themselves own. Now if that sounds like robbing your own pocket for a failure to fill that pocket adequately, you’re dead right in theory. What prevents this theory from becoming fact is that stock ownership has none of the strictures icons like Edison, Ford, Rockefeller or Carnegie faced. Those ‘owners of industry’ had to stick around and deal with the difficulties inherent in building wealth and value. Nasty little details like research and development, as well as long-term planning and marketing, keeping a dedicated work force together and assuring that their eye was on the ball in a changing marketplace. Current ‘investment owners’ simply sell their stock and move on to whatever pasture seems greener in the coming quarter. Essentially, they have no skin in the game. They make their money by avoiding the nasty details, ‘drawing and quartering’ the companies in which they invest and moving on. If you can’t get your head around why that happens in this day and age, look at how we have contrived to reward CEOs. Most CEOs of large businesses draw a minimal salary and are up to 90% compensated by stock options—the ability to take discounted options, not available to other investors, on the company stock price and make millions (occasionally billions) by pumping that stock full of air in the short term. Certainly by any standards that’s treason against the corporate body, yet there’s not a whimper of protest as our Dow Jones sits comfortably above 15,000 and the nation staggers at or near poverty levels not seen for three quarters of a century. So we have two separate factions in the corporate world, each profiting in the short term while ignoring the basic health of the company—owners (investors) and managers (CEOs). But surely Boards of Directors are there to prevent just such corporate chicanery. Not so. Board members are self-interested as well. These co-conspirators mostly have their careers behind them, yet the average compensation for board membership in Fortune 500 companies is $250,000 for an average of eight meetings a year. Pretty nice compensation when you combine several board memberships along with perks such as corporate air-travel and generous expense allowances. The modern investor-owner with the full support of its corporate board operates on the Bain Capital template, taking over under performing companies and stripping them of assets. Chuck the pension plan, close down R&D, fire the older (expensive) employees and replace them with young and inexperienced temporary workers, thus guaranteeing a rise in stock price, pocketing a bundle and leaving not much but smoldering wreckage behind. But who cares, if it was a good quarter and the ownership moves on? The question is, how long can we sustain the drawing and quartering of American corporations?